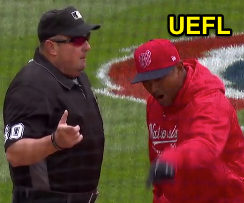 HP Umpire Marty Foster ejected Nationals 3B Anthony Rendon and Manager Dave Martinez (strike two and three call; QOCN) in the bottom of the 3rd inning of the Mets-Nationals game. With two out and none one, Rendon took a 2-1 curveball and 2-2 changeup from Mets pitcher Steven Matz for called second and third strikes. Replays indicate the 2-1 pitch was located over the heart of home plate and at the upper midpoint (px -.028, pz 3.474 [sz_top 3.411 / MOE 3.494]) and the 2-2 pitch was located over the inner edge of home plate and below the hollow of the knee (px -.795, pz 1.474 [sz_bot 1.565 / MOE 1.482]), the call was incorrect. At the time of the ejections, the game was tied, 0-0. The Mets ultimately won the contest, 3-2. These are Marty Foster (60)'s first and second ejections of 2018. Marty Foster now has -4 points in the UEFL Standings (0 Prev + 2*[2 MLB - 4 Incorrect Call] = -4). Crew Chief Joe West now has 0 points in Crew Division (0 Previous + 0 Incorrect Calls = 0). *The 0-2 pitch was located 0.096 vertical inches from being deemed a correct call. These are the eighth and ninth ejections of the 2018 MLB regular season. This is the 5th player ejection of 2018. Prior to ejection, Rendon was 0-2 (2 SO) in the contest. This is the 4th Manager ejection of 2018. This is Washington's 2nd/3rd ejection of 2018, 1st in the NL East (WAS 3; ATL 2; MIA, NYM, PHI 0). This is Anthony Rendon's first ejection since June 15, 2016 (Bob Davidson; QOC = Y [Balls/Strikes]). This is Dave Martinez's first ejection since July 17, 2011 (Chad Fairchild; QOC = U [USC-NEC]). This is Marty Foster's first ejection since September 3, 2017 (Paul Molitor; QOC = N-C [Check Swing]).